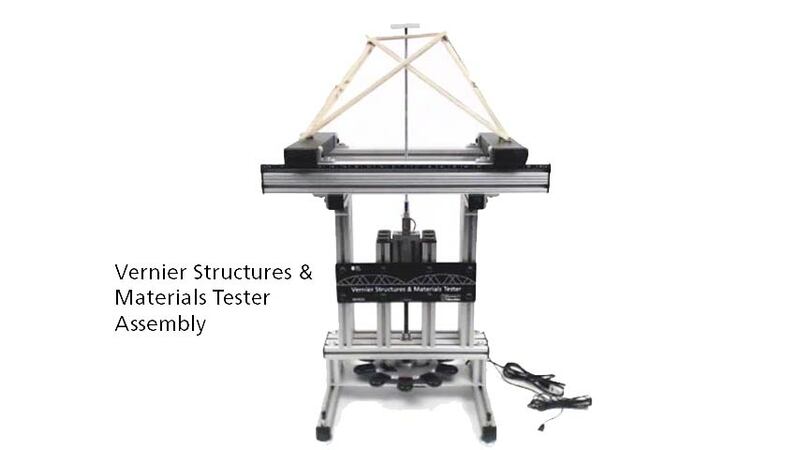 Evaluate the strength of model bridges and engineered structures by measuring the applied load with the Vernier Structures & Materials Tester. Utilizing both load and displacement sensors allows students to evaluate properties of materials (stress and strain). The Vernier Structures & Materials Tester (VSMT) is the perfect device for all project-based STEM and engineering classrooms. Use the Tester, along with the engineering design method, to design, build, and test structures, conduct bridge competitions, and investigate and analyze beam designs and material properties. The Tester is equipped with a load cell (measuring up to 1000 N) and a displacement sensor (0.1 mm resolution). Using both sensors allows you to record maximum breaking loads, as well as load/displacement characteristics to allow students to evaluate stress and strain. Use Logger Pro video analysis in conjunction with your sensor measurements to see how and when things bend and break. The top support beams of the Tester are designed to easily slide and lock into position. Ruled markings located on the Tester allow you to accurately position the support beams for center or off-center loading. The VSMT ships with a well-outfitted VSMT Tackle Kit that includes a 50 x 50 x 6 mm and a 50 x 80 x 6 mm aluminum load plate, chain, rods, U-bolts, and other accessories to make it quick and easy to load bridges, materials, beams, and structures of varying sizes and shapes. Bridge building contests are an excellent platform for teaching engineering principles. A single bridge, however, can take a lot of time and material to complete. The Truss Tester Accessory allows students to focus on the design of a single truss, so the opportunity to learn from their efforts and engage in the engineering design process is emphasized, without spending an extraordinary amount of time building several bridges. 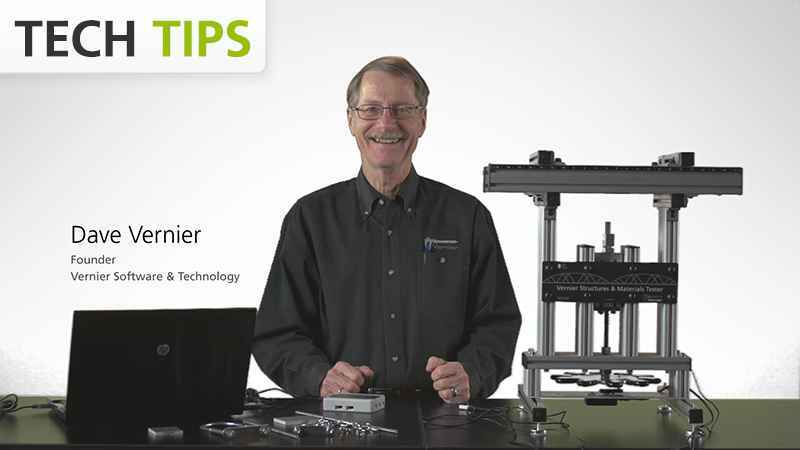 David Vernier introduces the Vernier Structures & Materials Tester. Use the Tester, along with the engineering design method, to design, build, and test structures, conduct bridge competitions, and investigate and analyze beam designs and material properties. Tom Smith evaluates the strength of engineered beams by measuring the applied load with the Vernier Structures & Materials Tester. Use the Tester, along with the engineering design method, to design, build, and test structures, conduct bridge competitions, and investigate and analyze beam designs and material properties. 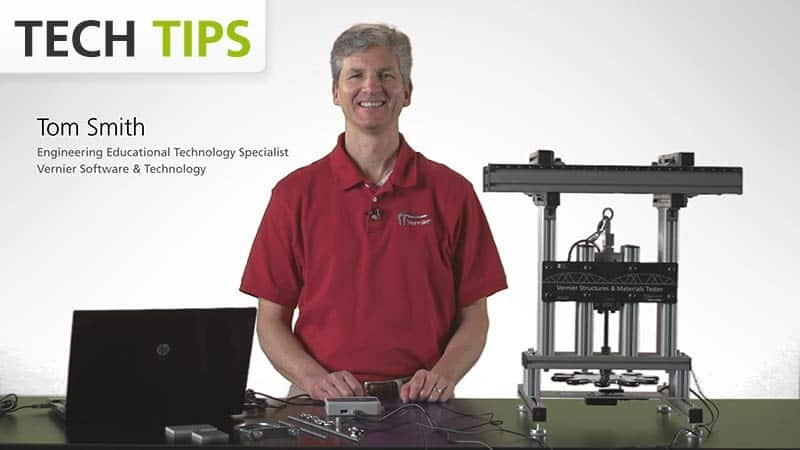 Watch this brief video to learn how to assemble the VSMT for use in testing materials strength and model bridges. Students can explore properties of materials and beam construction. These experiments are designed around the deflection of a beam supported on both ends and loaded by a downward force at its center. Preview and/or edit the experiments for your curriculum by downloading the experiments below. The Student download includes objectives, materials, procedures, and analysis. The Instructor download includes notes, sample results and graphs, and answers. Logger Pro software contains experiment files that facilitate experiments and investigations for most of our sensors and probes. Here is a brief summary of the files created for the VSMT. You can find these files by clicking on File > Open > Probes & Sensors > Structures & Materials Tester in Logger Pro. The VSMT is an ideal tool to use for class bridge and structure engineering and design competitions. Students can test their bridges or other structures to determine the maximum force or efficiency (force/weight of bridge). This activity is designed to allow the student to test a single unit and evaluate its performance and failure mechanism. Combine this activity with Logger Pro‘s Video Capture to analyze the point of failure, develop explanations, and re-design the structure to improve performance. This activity is at the heart of the engineering design process. Students can explore properties of materials and beam construction. These experiment files are designed around the deflection of a beam supported on both ends and loaded by a downward force at its center. Vernier Bridge Competition Software is a free standalone application for Windows® computers used for bridge (or other structure) competitions conducted with the Vernier Structures & Materials Tester. The software provides a visual representation of the force acting on the structure, as well as a comparison to previously tested structures. The Vernier Structures & Materials Tester may require a compatible interface and software. Choose a platform below to see compatible interface and software options. The Vernier Structures & Materials Tester is fully supported with LabQuest 2 (version 2.8.5), a standalone data logger with built-in graphing and analysis software. The Vernier Structures & Materials Tester includes one VSMT Tackle Kit.